This post is a summary of Van de Walle de Gheicke, Rossion and Lochy’s (2018) study investigating the impact of different approaches to teaching reading on the development of neural circuits. It is known that adult expert readers have a highly automated, rapid and accurate recognition of words that integrates their knowledge of the words’ orthographic, phonological and semantic properties. Neuroimaging studies have shown that this expertise relies on a left cortical network involving three circuits (ventral, dorsal, anterior) which are activated to interconnect vision and language. Developmental studies have revealed that the left circuits’ specialisation for reading is thought to emerge during the learning of phonic mapping of letters and letter combinations to sounds. The common methods used to teach reading are a whole language approach in which children are taught to visually memorise whole words as a single unit, a phonic approach in which children are taught to map letters and letter combinations to speech sounds or a combination of the two. The participants in this study (year 1 French students in their first trimester of school) had been taught using a mixed approach in which some words had been taught as whole words (without any teaching of the letter-sound associations within the word) and they had also been explicitly taught letters of the alphabet (one a week) using a variety of activities including writing the letter, recognising it within words, learning its case variants, etc. (but not it would seem blending and segmenting activities or other phonological awareness activities containing those letters). At the time of the study, 9 letters had been taught. pseudo words that were pronounceable letters strings based on similar real words. After the experiment children were tested on their knowledge of the letters used in the words and on average 14/18 letters were recognised. In addition, the children were also shown letter strings consisting of a pseudo font. These were built on the basis of the real words used in the study. Each word was vertically flipped and the letters segmented into simple features. These features were rearranged to form pseudo letters which were similar in size, black and white contrast, junctions, and ascending and descending features to the real letters from which they were built. This pseudo font was then used to form pseudo words which had the same total number of characters as the original word. A composite reading score for each child was calculated by averaging scores for graphemes, syllables and word reading. Based on this score, each child was assigned as a good reader (above the group mean) or a poor reader (below the group mean). In this study, letter strings triggering phonic mapping predominantly triggered activation in the left hemisphere of the brain. 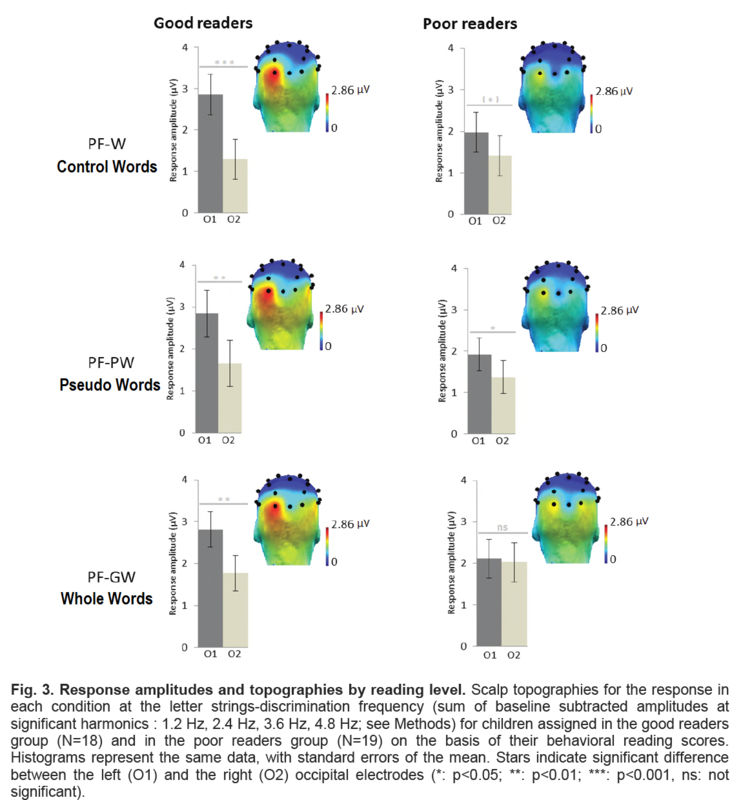 Good readers had a higher level of activation in the left hemisphere than the right hemisphere compared to the poor readers, irrespective of whether they were shown a control word, a pseudo word or a word that they had been learning as a ‘whole word’. Poor readers had left hemisphere activation for the pseudo words and control words, but also had right hemisphere activation for ‘whole words’. 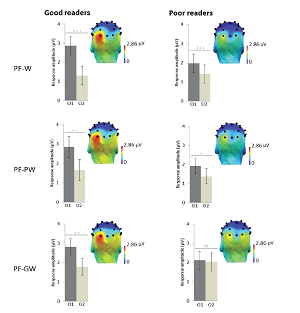 Poor readers generally had less activation overall compared to good readers. The two brain hemispheres are hypothesised to preferentially support different types of processes. The left hemisphere is more likely to be engaged in analytic/local processes, while the right hemisphere is more likely to be engaged in holistic/global processes (for example object and face recognition). Phonic mapping predominantly engaged the left hemisphere. This supports previous studies showing left lateralisation in response to letter strings occurs during reading acquisition. The dominant left hemisphere engagement is also associated with ‘expert’ reading in adults, with activation increasing with age and reading level. A knowledge of all letters or letter combinations is not necessary for this left hemisphere activation to occur as evidenced by the good readers in this study. Good readers had sufficient phonic mapping skills to be able to infer the phonic mapping of words that were taught as ‘whole words’, while poor readers relied on whole word recognition even though all children had equal familiarity with the words. If these poor readers cannot apply phonic mapping, they must store written words as visual objects which is likely to impede reading acquisition because of potential confusion between visually similar words and an inability to self-teach new words through the ability to decode. The researchers raise the concern that reading is taught with an emphasis on learning whole words as single units or taught using a combination of phonics and whole word learning, some children may find it difficult to reach a sufficient level of automatic phonic mapping and consequently try to process all written material by attempting to remember all words as a single unit. Shows the importance of systematically and explicitly teaching phonics to all children right from the point that reading instruction is commenced. Indicates orthographic mapping begins as soon as children begin to learn to read. Reflects Kilpatrick’s (2015) analysis of research showing that once good readers have some knowledge and level of proficiency in phonic decoding they begin to develop orthographic mapping skills simply by interacting with letters and words. As these students encounter new words they instinctively attend to the internal structure of the word to decode it and that attention to the letter structure is sufficient for them to map the word to other similar letter patterns, internalise and subsequently remember that particular letter string. After 1 to 4 exposures these students are likely to remember the word. In comparison poor readers do not self-teach and may need “10, 20 or more exposures” to a word before it is remembered. Kilpatrick, D.A. (2015). Essentials of Assessing, Preventing and Overcoming Reading Difficulties. John Wiley & Sons : New Jersey.